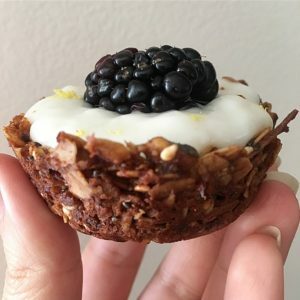 I wanted to share with you guys this delicious recipe for granola cups; this is what a healthy dessert option looks like you guys! Honestly, how cute would these be for a brunch party? What is awesome is you can make them ahead of time and store them in an air tight container for when you would like to use them. Also, you can literally top them with anything your heart desires. 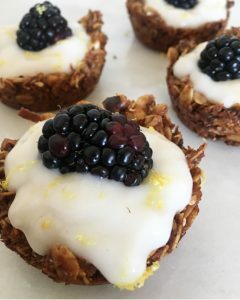 I topped mine with some dairy free vanilla yogurt and blackberries along with a sprinkle of lemon zest. I have been utilizing a muffin tin for recipes all week and this one is aesthetically one of my favorites. There are so many things you can make with a muffin pan both savory and sweet! Check out my other posts to see what else I whipped up using a muffin tin. Also would like to mention that this recipe is also super easy; the only part that may give you a little hard time is taking them out of the pan. 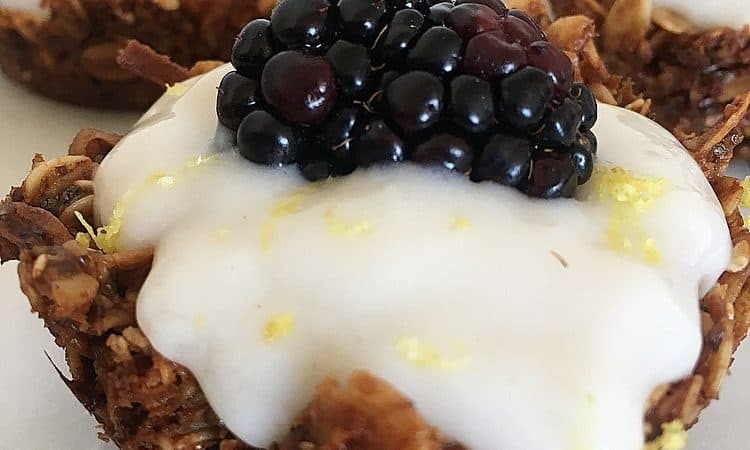 Just gently use a butter knife to go around the sides of the granola cup and it pops right out. Make sure it is completely cooled or else it will start to crumble! In a pan, melt coconut oil, almond butter, and honey together. Add the vanilla extract as well. This shouldn’t take more than a minute. Set aside. In a bowl, combine the shredded coconut, oats, flax seeds, chia seeds, cinnamon, sesame and walnuts. Mix together. Add the liquid into the dry ingredients and stir all together. Set in the fridge to harden a bit for 10-15 minutes. Prep a muffin tin by greasing it with some nonstick spray. Fill each opening about 2/3 of the way. Press down gently on the center and work around the edges. This may be difficult because the mixture is sticky. I highly recommend having a small bowl of cold water beside you while you are doing this. Dab your fingers into the water and work with placing the oat mixture in the pan. It is much easier this way. Place muffin pan into a preheated 320 degree oven. Bake for 20 minutes. Take out and allow to cool completely before trying to take granola cups out of pan. Once cool, use a butter knife to go around the edges gently and that will loosen the granola cups out. Store in air tight container to be ready whenever you would like a small treat. Top it with yogurt of choice and some fresh fruit for a delicious treat!